When comparing this to Ninja (similar cost, in-faction Killer) it looks quite good. There are six Sentries with strength of more than 5, one of whom is multityped (Orion). Boosting both breakers to match costs 6 (exception - Janus 1.0 and Orion costs 8 to match with Alias). 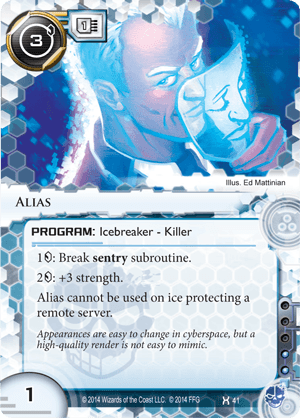 Alias is slightly more economical with breaking low-strength Sentries, most importantly at strength level 3 and 4: Architect, Data Raven, Neural Katana, Ichi 1.0, Information Overload. It also goes through Komainu without additional boost. At the same install cost, Mimic handles Sentries up to 3 strong, 4 with Datasucker (so the most interesting range) without additional costs and breaks through remote servers. With added support of Faerie it manages on it's own in most important cases. That means Alias is usable only when you are too tight on influence and/or memory to handle Mimic/DS combo (eg. Iain) and aim to pressure centrals. That makes it very focused specialist, with only but a few decks to fit in. And even then, it is a fair warning message: "If you need this, rethink your deck."